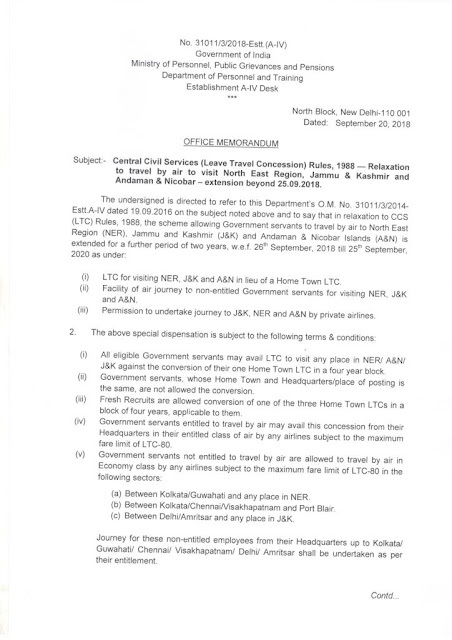 Subject:- Central Civil Services (Leave Travel Concession) Rules, 1988 - Relaxation to travel by air to visit North East Region, Jammu & Kashmir and Andaman & Nicobar - extension beyond 25.09.2018. (iii) Permission to undertake journey to J&K, NER and A&N by private airlines . (i) All eligible Government servants may avail LTC to visit any place in NERI A&N/ J&K against the conversion of their one Home Town LTC in a four year block. (ii) Government servants , whose Home Town and Headquarters/place of posting is the same, are not allowed the conversion . Journey for these non-entitled employees from their Headquarters up to Kolkata/ Guwahati/ Chennai/ Visakhapatnam/ Delhi/ Amritsar shall be undertaken as per their entitlement. (vii) Air Tickets are to be purchased directly from the airlines (Booking counters, website of airlines) or by utilizing the service of Authorized Travel Agents viz. 'M/s Balmer Lawrie & Company', 'M/s Ashok Travels & Tours' and 'IRCTC' [to the extent IRCTC is authorized as per DoPT's O.M. No. 31011/6/2002- Estt. (A) dated 02.12.2009] while undertaking LTC journey . Booking of tickets through other agencies is not permitted and no request for relaxation of rules for booking the tickets through such agencies shall be considered by this Department. 3. Efforts should be made by the Government servants to book air tickets at the cheapest fare possible. All the Ministries/ Departments are advised to bring it to the notice of all their employees that any misuse of LTC will be viewed seriously and the employees will be liable for appropriate action under the rules. 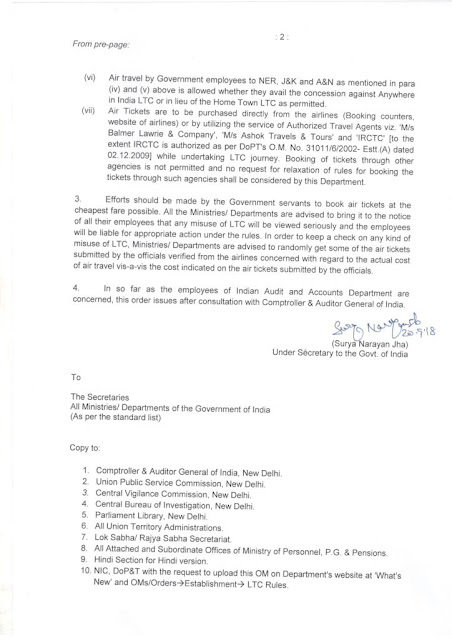 In order to keep a check on any kind of misuse of LTC, Ministries/ Departments are advised to randomly get some of the air tickets submitted by the officials verified from the airlines concerned with regard to the actual cost of air travel vis-a-vis the cost indicated on the air tickets submitted by the officials .